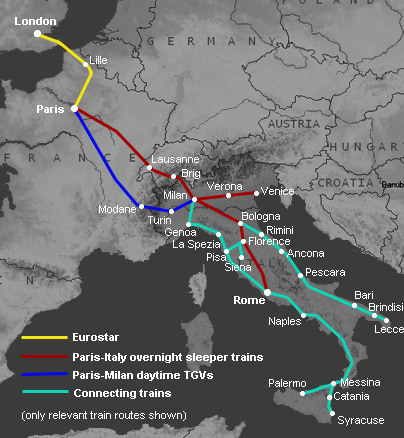 It is 893 miles from London to Rome. It will take about 18 hours of driving to cover the 1163 miles from Europcar at London Heathrow Airport to Aeroporto Fiumicino; taking you past Ewell, Lille, Rheims, Troyes, Dijon, Geneva and Genoa. The trouble with hiring a car for the trip are the extra fees payable if you pick it up in a different country to the one you drop it off at. Map of London with airports, Stazione Tiburtina and Stazione Termini pinpointed. Map of London with airports and Victoria Coach Station pinpointed. It is is an hour later in Rome (Italy) than in London (England). We suggest setting your watch to Rome's time as soon as you board your flight (the earlier you begin acclimitising to the time zone the easier). Rome has warm dry summers and cool wet winters. 25 March 2012. Monarch Airlines starts flying between London Luton & Rome Fiumicino airports.